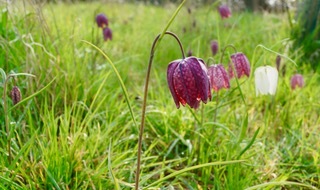 Far be it from me to flaunt my fritillaries, but this year they have been surprising on two counts: first, I usually spend the days in the run-up to them emerging, staring at a patch of earth in a former pig enclosure (known by our children as the fairy field), for any sign of fritillary action. This year Fritillaria meleagris is unfurling without the aid of my ever-vigilant gardener’s eye, and rewriting the age-old proverb about watched pots never boiling by demonstrating that unwatched fritillaries flower in greater number than scrutinised ones. The second reason fritillaries have been surprising this year (and the key cause of me taking my eye off them in the first place) is that other gardeners had warned me about fritillaries dwindling in number, probably due to the dry weather last summer. Of course, I know better than to gloat (we only have to consider my apologies for cauliflowers to put paid to any notion of gardening pride - and yes, I resolutely keep on trying with my pitiful cauliflowers because we gardeners are an optimistic bunch), but for once, my claggy clay soil trampled by years of pigs and all the blessings they have to offer to the earth has come up trumps; and as that other gardening proverb goes - if my fritillaries are happy, the bees are happy, and I’m happy. Elsewhere in the garden, there are a few flowering shrubs that have been sustaining pollinators for months now. The most astonishing is rosemary. We have been enjoying rosemary flowers in our windy corner of Norfolk since 2018. 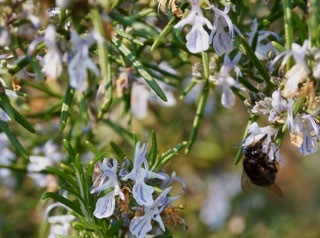 I grow several plants, mainly Rosmarinus officinalis ‘Miss Jessopp’s Upright’, all of them have bloomed for months now, and on a sunny day they are smothered in bees. 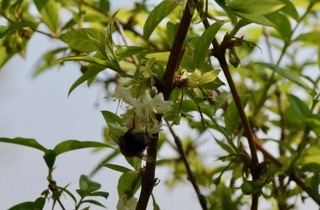 Another amazingly long-flowering shrub is Lonicera fragrantissima. It has bloomed through winter and it is still putting out a small handful of admittedly rather sad, apologetic flowers that I would never have noticed but for the bees homing in on them as if they are the best spring treats available; and this is despite the shrubs being underplanted with nectar-rich flowers. 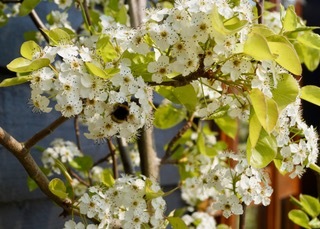 Pyrus calleryana ‘Chanticleer’ is in full bloom now. On a sunny day it is smothered in bees and butterflies. 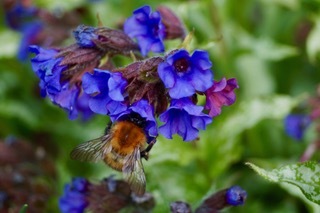 Nearer the ground, my ever-expanding collection of Pulmonaria is gently carpeting the borders with flowers of white, blue, pink and royal purple. 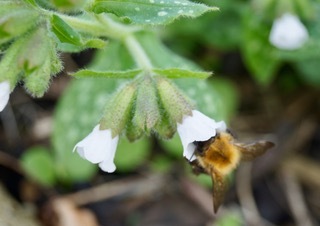 This week, the most popular with bees are Pulmonaria ‘Diana Clare’ and P. ‘Sissinghurst White’. I don’t find Pulmonaria seedlings a problem - there is always space for more of these little flowers, and even if I were to think otherwise, those seedlings have their own ways of finding space. I am especially looking forward to seeing how the particularly splendidly speckled Pulmonaria that seeded itself slap bang in the middle of Hosta ‘Krossa Regal’ fares. If it’s any good, forget flaunting my fritillaries, I shall be parading my pulmonaria! I am always fascinated in the plants other gardeners value for their benefit for wildlife, so please let me know if you have any plant recommendations. This post will be linked to Garden Bloggers’ Bloom Day hosted by https://www.maydreamsgardens.com where gardeners around the world write about the plants in flower in their gardens. Sarah Shoesmith is a garden writer who blogs at http://www.thegardeningshoe.blogspot.com . 0 Comments To "On the Menu for ...April 2019"